Our friend and blogger, Ewan Kennedy, shares his passion for all things Clyde and West of Scotland nautical – especially the wonderful cult of small boat building, sailing and rowing there, and the people involved in that, past and present – in his entertaining, educational… in fact, indispensable blog, Scottish Boating. Join him in celebrating three years at it. Ewan has even said some very nice things about our G.L. Watson book. This entry was posted in art, boatbuilders, boatyards, Clyde yachting, Clydebuilt, Firth of Clyde, G.L. 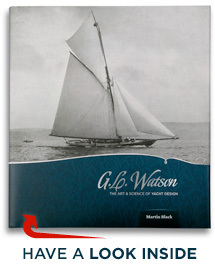 Watson, Glasgow, journalists, other yacht designers, photography, River Clyde, rowing, Sail and oar, yacht design, yachting history and tagged blog, Ewan Kennedy, Scottish Boating, Scottish Islands One Design. Bookmark the permalink.